Several people came early at 6 pm. on September 13, 2009 to avail of the Mini- Health Expo using CELEBRATION LIFESTYLE conducted by Northeastern Mindanao Mission (NeMM) Health Director, Pastor Nimrod V. Saramosing. Assisting him are a number of Health Professionals of Butuan City Chapter. They are doing this nightly before the lecture proper starts. The participants were very eager to avail of the imported gadgets used during the Health examination. At 7:15, the seminar was officially opened. Before the substantial lecture on Happy Family was presented by the renowned speaker, a melodious heavenly music was offered by “The Motivators”, the official singing group of NeMM. 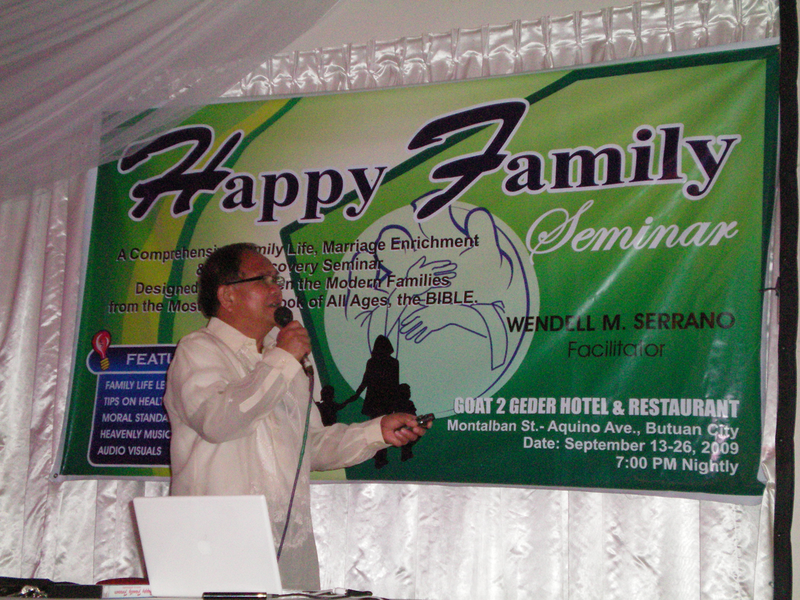 “It is a joy to conduct a seminar on family Life in my own province”, the speaker said. Because he hails from Jabonga, Agusan del Norte. He added that while doing seminars like this in some parts of the country, he feels that his own relatives, friends, and Agusanons need this too… He wants to help them improve their marriage relationship and strengthen the foundation of their homes not only for today but for eternity. The Topics were very challenging and Pastor Serrano presented each topic interestingly with down- to- earth and true to life illustrations. So Participants were excited to invite another friend to join the seminar the following nights. Every night the number of participants increases that the 250 people capacity of the hotel function hall could no longer accommodate everybody. However with the resourcefulness of NeMM Staff, the excess number of people were given extra seats outside the Function hall. They were provided with a Video Screen for them to hear and see the lecture. What makes it wonderful is that the hotel management opened their sound system at the hotel’s lobby where most of the lodgers can hear or listen. This seminar is well advertised in churches around the city. In fact prior to this main event of Pastor Serrano, The different Departmental Directors of NeMM conducted 2-weeks satellite meetings in different venues near the city. The 6 venues are: 1. Butuan City Church- with Sabbath School Director, Pastor Jerson P. Arellano as lecturer. 2. Butuan Central Church-with Health Director, Pastor Nimrod V. Saramosing. 3. De Oro Church- with Youth Director, Pastor MaxDante B. Obbus. 4. Bading church- with Philanthropic Director, Pastor Ruel G. Arrogante. 5. Buenavista Church- with Education Director, Mrs. Nilda E. Caberte. 6. Nasipit Church –with District Pastor Jose Conrado Hermoso. The seminar is still going on and will soon end on September 26, 2009. We are hoping that the challenges that have been felt by the participants will continue to grow in their hearts , build up their homes strongly to be little heaven on this earth, and make a full commitment to love God above all things and surrender their lives to Jesus. What a GREAT REJOICING it will be!! !